Labour Leader Ed Miliband has set-out his ten year plan to turn “hierarchical Britain” into a modern Britain free from “throw back dogma”. The speech at Labour Party Conference laid out six key promises he plans to deliver if they win the general election next May. The six commitments all had a deadline of 2025, which would require two full terms of a Labour government to deliver. But in that time a Miliband Premiership hopes to have delivered higher wages, banking reform, a greener economy, more apprenticeships and housing development. He also pledged an “NHS with time to care” by creating thousands of new jobs in the service in fields like midwifery and general practise. He claimed his NHS pledges could be paid for by closing tax loopholes for hedge funds, implementing a mansion tax and taxing tobacco manufactures. These taxes are hoped to raise £2.5bn, that would be set aside in a special fund also called “time to care”. He also pledged to repeal the Health and Social Care Bill to rapturous applause. On low pay he reiterated his promise to raise the national minimum wage to over £8 an hour by 2025. He also promised to “break-up the banks” and give as much legal protections to the 5 million self-employed as are enjoyed by full-time staff at companies. Miliband also said he would raise the number of apprenticeships to be equal to the number of university places by 2025. He conceded governments had struggled before but cited an example of a girl who had got an auto-electrical apprenticeship under this government as proof numbers could be boosted. He also pledged a massive new home building project that would lead to the number of first-time buyers doubling by 2025. He claimed all these groups felt like government were saying to them “you’re on you’re own”. Miliband claimed the solution to this was to give David Cameron more time to play tennis and angry birds – both of which he is said to enjoy – by depriving him of his job next year. He claimed the “real concrete ideas” could “restore faith in the future” and ensure that the economy is no-longer run for the few. But there was almost no mention of dealing with the question of how to ensure England’s voice, aside from offering more powers to local councils. His major constitutional change was to offer votes in the general election with 16 and 17 year olds. 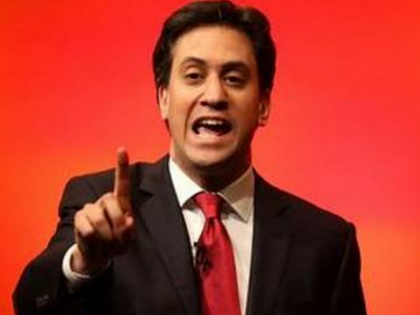 Aside from the key pledges Miliband also reaffirmed his support for membership of the European Union. He claimed David Cameron was unable to win the “28 to 1” fight to gain unanimity on reforming the bloc. He also said that Labour would commit to helping create a Palestinian state and appoint Lord Cashman an a gay rights envoy. He described the next eight months as a “job interview” in which he would prove that he would “use the powers of government” to stand up for everyday people. The reception was good but not spectacular, certainly nowhere near where he should expect to be given his poll lead. His aims are some of the least ambitious Miliband has every pledged, but with a lack of money he really had nowhere to go.